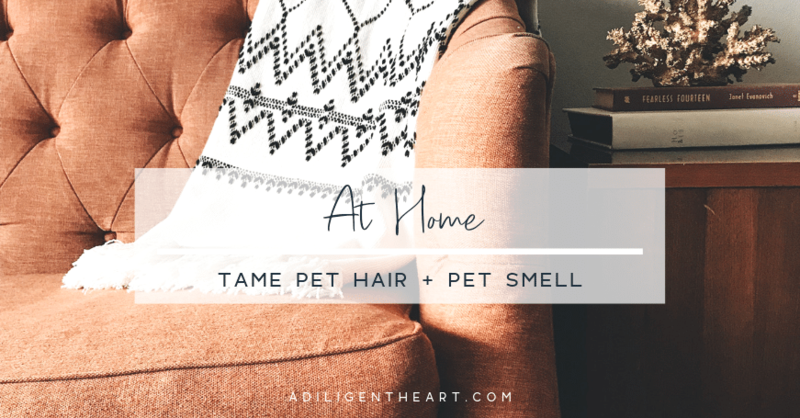 Ever been to a pet-friendly home and as soon as you walk in you’re hit with the smell of them? I’m not talking dirty cat litter, but actual pet smell. 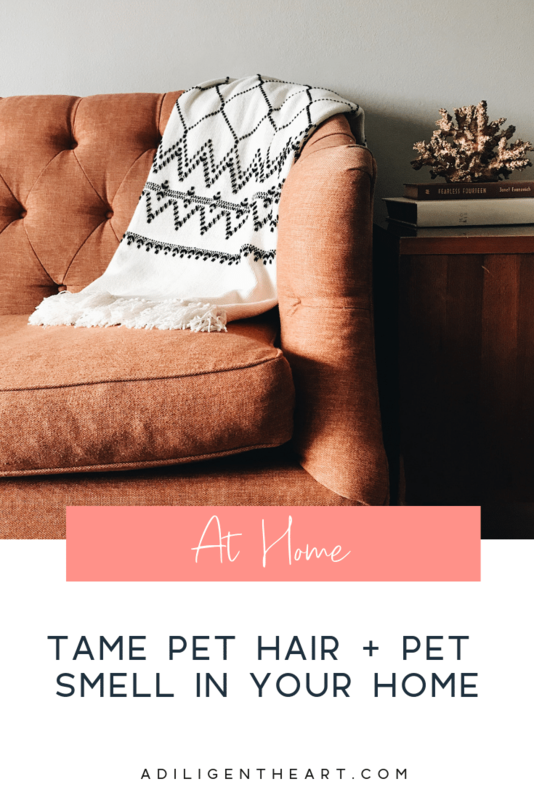 Live in a pet-friendly home? Then surely you’ve experienced the madness of taming pet hair. And let’s not start on the stink that usually comes with pet-friendly homes. We have six pets – two dogs and four cats. One of our dogs, the mini labradoodle, barely sheds – if at all. But our coonhound sheds a lot. Of our four cats, two of them shed massively, and the other two barely shed. So six animals, three shed a bunch – making it easy to feel like their hair is taking over if it’s not kept under control. Wow! your house does NOT smell like you have pets. And your house isn’t covered in pet hair! And I kinda love that reaction! Every other day we take our dog that sheds a lot outside and just rub him down with these grooming gloves on. He loves it – it feels like a nice full-body scratch down. I also do this outside so the hair that comes off doesn’t end up in the house. These have been a wonderful addition to our routine. We recently got them and I’m so glad we did! To start, we don’t keep the same blanket in our dog kennels too long. We rotate them about every two months. I don’t buy super expensive ones, just enough so they have something other than the floor of the kennel to sleep on. So, part one of this tip is to buy a cheap blanket for the kennel and toss it every two months. Part two of this tip is to, daily, take the kennel blankets and shake them out. Do this outside. Part three of this tip is to wipe down the entire kennel once a week. I’m hypersensitive to smells. I’m one of those people who can smell if the person I’m talking to has a cavity. It’s an annoying hyper-sense-super-power. We have three of these large cat litter boxes that our four cats share. And we use this cat litter. I use one bucket for each litter. This lasts a whole month and we haven’t had any issues. Clean litters twice a day. We do once in the morning and once during our evening chore time. Don’t keep dog food bowls full. When dogs eat, their saliva gets into their bowls. If food is left over after they are full, it can be prone to producing a smell that isn’t pleasant. We serve our dogs food and leave it out for a maximum of one hour. If they don’t eat it – they weren’t that hungry. We feed them twice a day. Wash weekly, rinse daily. Our cats tend to be a bit messier than our dogs with their food. Keep your dryer lint catcher clean. Rinse with water as often as you remember. In the am and pm, wipe down kitchen counters and table with a damp cloth (or just spray the surface) to catch any hair. These areas get a lot of traffic so any hair accumulated will get pushed around and lifted up to fall everywhere if you don’t remove it. I’ll use the lint roller over our fabric chairs too since our cats often sleep on them and I don’t want a bunch of cat hair on our clothes once we sit down to eat. We sweep daily, usually at the end of the day. If you have a roomba, put it on every night. If not , vacuum instead. I’m super picky so the kids take turns vacuuming and then when we all head to bed we put the roomba on. Carpets have a lot of hair? Sprinkle some baking soda, then vacuum, then turn on your roomba. This gets it all up! Weekly, or more as needed, wipe down window sills with a damp cloth to attract the hair to the cloth. Weekly, wipe down all your flat surfaces with a damp cloth. We do this daily because I like to keep things super clean and as pet hair free as possible. All the above is incorporated into our daily and weekly cleaning routines. The entire daily routine, for my two-story-nearly-3,000-sq-foot-house, takes about one hour. I have three kids, fully capable of helping with any chore in the house, so we all do this together and if we don’t mess around – it goes by super fast, like thirty minutes max. But we joke around while doing chores, or listen to music – so it takes a bit longer. Next time, I’ll be sharing more about my daily and weekly deep cleaning routines. If you’re interested in my routine and habits to keeping our home clean and fresh – be sure to subscribe, so my posts hit your inbox!